A Far Cry stands at the forefront of an exciting new generation in classical music. 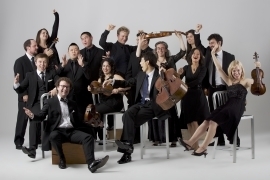 According to The New York Times, the GRAMMY nominated self-conducted orchestra “brims with personality or, better, personalities, many and varied.” A Far Cry was founded in 2007 by a tightly-knit collective of 17 young professional musicians — the Criers — and since the beginning has fostered those personalities, developing an innovative structure of rotating leadership both on stage and behind the scenes. By expanding the boundaries of orchestral repertoire and experimenting with the ways music is prepared, performed, and experienced, A Far Cry has been embraced throughout the world with hundreds of performances coast to coast and across the globe, and hundreds of thousands of online views of live streaming concerts and YouTube archives. “Dreams and Prayers” and “Law of Mosaics”, the first albums from A Far Cry’s in-house label, Crier Records, have collectively garnered a GRAMMY nomination and critical acclaim from The New Yorker’s Alex Ross. The Criers are proud to call Boston home, and maintain strong roots in the city, rehearsing at their storefront music center in Jamaica Plain and fulfilling the role of Chamber Orchestra in Residence at the Isabella Stewart Gardner Museum. Collaborating with local students through an educational partnership with the New England Conservatory, A Far Cry aims to pass on the spirit of collaboratively-empowered music to the next generation.